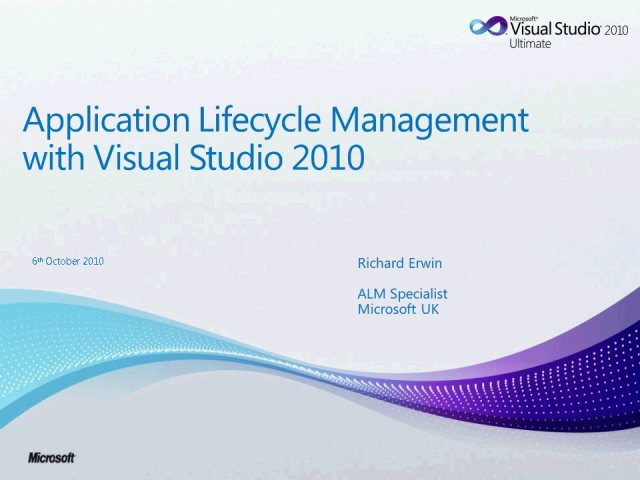 This session will give an overview of the Microsoft Application Lifecycle Management platform and demonstrate how developers, testers, project managers and other project roles can easily work together to deliver successful projects. The 2010 release has expanded the Microsoft ALM offering to include non-Windows users and provide Lab Management capabilities. Richard is an Application Lifecycle Management Specialist and part of the Developer and Platform Evangelism Group at Microsoft UK. Richard has been with Microsoft for 10 years starting as a Developer Support Engineer, troubleshooting and debugging complex customer development issues. Prior to joining Microsoft, Richard was a Software Engineer and gained a first class degree in Computer Science.